Before CNC machining was invented, all metalworking fabrication processes were completed with NC (Numerical Controlled) machines. 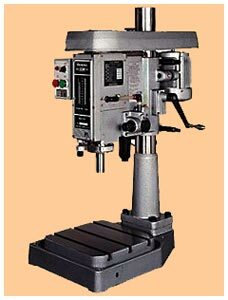 The concept of CNC was introduced in 1967 but the first CNC machines were introduced in 1976. Since then the popularity of CNC grew very significant and it was recognized as the industry standard in 1989. Today, almost all metalworking fabrication processes can be completed with CNC machines. Actually, there are many CNC variations for all metalworking equipment, such as grinders, turret punches, routers, milling machines, drills, lathes, EDMs, and high-powered cutting devices. The main advantage of CNC machining is to improve safety, productivity, efficiency, and accuracy in metalworking fabrication. With CNC, operators do not have to interact directly in the metalworking processes and it significantly reduces risks at workplace. Recently produced CNC machines can be operated continuously for 24 hours a day and 7 days a week. The machines only need to be turned off for regular maintenance. The reliability of these machines makes most companies to continue operating the machines during weekend, even without any human supervision. The machines are usually equipped with additional system that can contact off-site operator when an error occurs. When an error occurs, the process stops automatically. Although there are many large companies that specialize in building CNC machines for other companies, small shops or garages are actually able to build small CNC machines. It results to endless types of CNC machines. Even there are many hobbyists who continuously build small machines and promote the machines to small companies. Actually, the creation of CNC machines depends on the creativity of the maker and since there is no limit of creativity, there is no limit of the types of machines that can be built. The first advantage is that operators can maximize the use of raw materials and minimize waste. A skilled engineer might be able to make same components but when each component is thoroughly analysed, most likely the components are different. In this way, a company can increase profit through the optimal use of raw materials. The second advantage is that once an engineer correctly programs the machines, they can continuously produce same quality components in shorter time. CNC machines can shorten production processes, so a company can produce more components and receive more orders. Another advantage is on safety. As mentioned above, CNC automates almost all processes so operators do not have to interact with dangerous equipment. A safer working environment will be beneficial for both company and operator. CNC also helps a company to reduce the need of skilled engineers. One engineer is able to monitor several CNC machines. By employing fewer skilled engineers, a company can reduce expense on employee salary. Although CNC machines have been widely used worldwide; there are several disadvantages that all companies need to notice. The first main disadvantage of implementing CNC at workplace is the initial investment. CNC machines are very expensive compared to manually operated machines. However, these machines are beneficial for long term because it helps to minimize production costs. Another disadvantage is that when a company invests on these machines, it can leads to unemployment because the company needs fewer operators to complete all the metalworking processes. As a conclusion, with the speed and efficiency of CNC machines to complete various metalworking tasks, investing on CNC machining is highly recommended for companies to stay competitive and profitable.